I just came across your kind words/posting on my publicity client, KENNY VANCE. I recently added him to my roster and have been working diligently at conveying the same message that you so eloquently posted on your blog. It’s people like you who validate what Kenny does not only to him, but to the subsequent generations he is on a tireless mission to reach. I keep meaning to answer him back but as you may have noticed, time isn’t exactly on my side these days. Regardless, I’m always happy to give credit where credit is due and Kenny Vance deserves all the attention that comes his way… and you deserve a chance to hear his music. Kenny Vance and the Planotones are keeping the music alive and from where I sit, that’s all that really matters. I’ll sit and listen to ‘em by myself. Why do I bring this up? Well, as it turns out, one of the founding members of that group was a fellow named Kenny Vance. 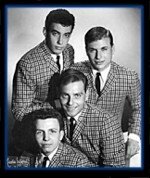 Yeah, I’d never heard of him either until one evening I was watching one of those Doo Wop specials on PBS television and among the performers was this group by the name of Kenny Vance and The Planotones. At the time, I thought they were a newly formed “cover band” and it seemed odd to me that they were included on a program showcasing classic artists from the 50’s… not that I cared because the song they did totally blew me away. Note: If you don’t have a high-speed connection, you can still view YouTube videos. Just let it play through once (it will stop and start several times). Once it’s done, just click it again. I’ll play correctly now that’s it’s loaded into your cache (or temporary Internet files). He was the producer for the rock band, Steely Dan and for a while was the musical director for Saturday Night Live. During the making of the film “American Hot Wax,” he put together several bands … including one called The Planotones … for the purpose of shooting the movie. His goal was to recreate the early days of rock & roll as a way to tell the Alan Freed story. Jumping ahead a few years… he re-formed The Planotones in 1992 and they are still performing to this day. All of this has been my longwinded way of saying that – even though you may have never heard his name before – Kenny Vance has been around since the beginning and that’s why he was included on the PBS Doo Wop special.